Problem: Different test runs require different configuration on Sauce Labs. 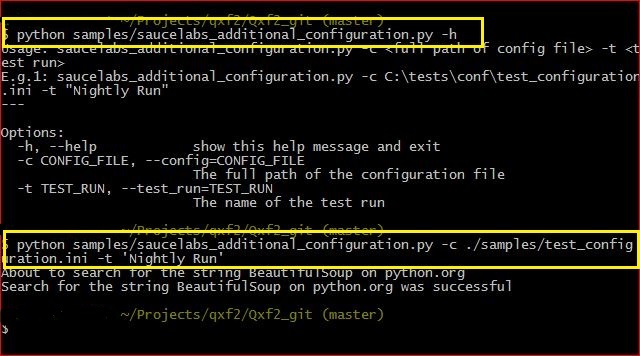 In this post, we will show you how to make your automated test runs to use specific configuration parameters of Sauce Labs. NOTE: We have chosen to disable video recording, screenshot, video upload on pass to speed up our test runs. In our previous post, we showed you an example of accepting command line arguments in our test scripts. In this post we will modify the command line parameters to accept the configuration file and test run name. The code snippet to accept the configuration file and command line is given below. "Example class written to run Selenium tests on Sauce Labs"
"Setup for this test involves spinning up the right virtual machine on Sauce Labs"
"An example test: Visit python.org and search for BeautifulSoup"
print "Search for the string BeautifulSoup on python.org was successful"
Here is a screenshot from our machine. Voila! You can run your automated Selenium test runs with different configurations. Really useful! 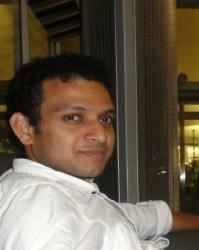 I like this blog very much! From this page https://saucelabs.com/account I can always see “Results” as “Finished”. Then I failed my unit test case deliberately, but still get “Finished”. Is there any good way I can see pass or fail in the sauce page obviously?